Established in 1872 as the Jones Brothers Tea Company, Grand Union was a 200-store chain forty years later. By the 1930s, it was one of America’s largest food chains, with over 700 stores in 1931. The number of stores dropped later in the decade and into the 1940s, as stores were consolidated into the larger supermarket format. 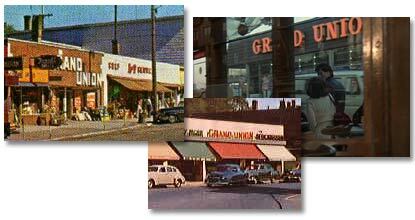 In 1956, Grand Union opened the first Grand Way discount department store in Keansburg NJ. The company also moved into other reatil formats during the 1960s and 1970s, with mixed success. There was also an expansion to Florida. By 1975, Grand Union, then under the ownership of Cavenham Ltd, a British food concern owned by James Goldsmith, was in trouble. The Grand Way stores and numerous supermarkets were closed. In 1978, Grand Union acquired Colonial Stores and Big Star Foods, based in Atlanta. In 1980, the company merged with Texas-based Weingarten’s. The upscale “Food Market” prototype was introduced in 1979, and was somewhat successful. As 1982 began, the company had more than 850 stores. By the end of the year, there were only 671. Grand Union was in trouble. The upscale stores were not as successful in working class areas, and in some of the southern markets. The Carolinas Big Star stores were sold to Harris Teeter between 1984 and 1988. The Georgia Big Star stores went to A&P in 1992. The Texas stores were sold to Safeway, Randall’s, and Gerland’s Food Fair. A series of buyouts, bankruptcies, and reorganizations culminated in a final 2001 liquidation in which C&S Distributors acquired most of the company’s assets. Many stores were sold to Hannaford, Price Chopper, and Shaw’s among others. C&S opted to run some of the remaining stores on its own, mainly in rural areas and small towns, and these stores adopted the Grand Union Family Markets banner. I’m a former employee of Grand Way, owned by Grand Union. Why are there no pictures of Grand Way stores?????? ?